A group of senior United States university representatives has visited Iran, in what is believed to be the biggest academic delegation since the 1970s. As relations between the two countries begin to thaw, the delegation met representatives of 13 Iranian universities and research institutes. The symbolic visit revives what were once strong academic links. Before the Islamic revolution in 1979, Iran was the biggest source of overseas students in the US. There are now about 11,000 Iranian students in the US - compared with 270,000 from China - and it is believed that there are no students at all from US universities on exchanges to Iran. And there are still no formal diplomatic relations between the two countries, after decades of hostility and suspicion. The university delegation was headed by Allan Goodman, president of the Institute of International Education, a New York-based organisation that supports US international education exchanges. Prof Goodman, speaking on his return, said that the US delegation had come away with a strong sense of the Iranians wanting more engagement with the West. And he said this had been helped by a legacy of links in previous generations between Iranian students and the US. It has been reported that the current Iranian cabinet has more holders of PhDs from US universities than any other government in the world, including the US. This includes Foreign Minister Mohammad Javad Zarif, who studied at San Francisco State University and the University of Denver. The delegation, visiting universities including Tehran, Shiraz and Isfahan, had received an "extremely warm" reception from Iranian students, said Prof Goodman. "There were deep reservoirs of affection for the US higher education system," he said. This ground-breaking visit had representatives from five invited universities and colleges, along with officials from the Institute of International Education. Prof Goodman said that the next likely step would be a reciprocal visit by Iranian academics to US universities. There would also be a report published next month with ideas for wider co-operation and partnerships. He forecast that the numbers of Iranian students recruited by US universities was also likely to increase. The decision for the US representatives to travel to Iran reflected the more outward-looking stance being taken President Hassan Rouhani, said Prof Goodman. The Iranian president has a PhD from Glasgow Caledonian University in the UK. The Iranian coverage of the visit also noted the re-opening of doors. The official Iranian news agency reported that the chancellor of the University of Tehran had told the US delegation that his university had once had links with "many American universities and is ready for resuming such ties once again". 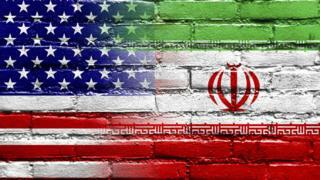 Tehran University's website reported that the two sides had emphasised the "necessity of expanding academic collaboration" between the Iranian university and universities in the US. The meetings took place against the background of continuing international negotiations about Iran's nuclear programme, with a deadline set for their completion by the end of June. Prof Goodman, a former executive dean of the school of foreign service at Georgetown University, described the university links as "educational diplomacy". He said the university sector could lead such bridge-building initiatives between countries "often before full diplomatic relations have been restored". There had been similar processes with universities making links with China and Vietnam, he said. And similar steps were likely with Cuba. He said there were parallels with the so-called "panda diplomacy" when China was trying to make connections with other countries. The gift of a panda to another country had become an unofficial diplomatic gesture, a signal of friendship without the formal signing of treaties. And it was now the higher education sector that provides such an opening. "The thawing in relationships, the normalisation, begins in the universities," said Prof Goodman. In June last year, restrictions were lifted on online courses to Iran. The California-based Coursera online university network was able to provide courses for students in Iran, which had previously been blocked by US sanctions. The prospect of closer academic links has had its critics. After the University of Massachusetts Amherst reversed a ban this year on allowing Iranian students to take some advanced engineering and science subjects, David Vitter warned of a security risk. "We currently have strict sanctions on Iran because of their nuclear threat - so training Iranians in the nuclear field at taxpayer funded US colleges doesn't add up," said the Republican senator for Louisiana. Within Iran, universities have been caught up in a power struggle between moderate and hard-line elements. Last month, more than 700 Iranian professors wrote an open letter warning that pressure from ultra-conservative religious groups, which had caused the cancellation of lectures and cultural events, was threatening academic freedom. The academics said they needed "sufficient independence to make decisions and sufficient security to think freely". A member of parliament had also been violently prevented from speaking to students at the University of Shiraz. Prof Goodman said his visit had made him "look behind the headlines" and left him optimistic about the direction of travel towards greater co-operation with the West. There was "enormous goodwill toward the United States" in terms of higher education and a desire to "join the community of nations", he added. Prof Goodman said the bridge-building efforts needed to look forward. "We need to avoid the tendency to keep looking in the rear-view mirror," he said.